In my never-ending quest to spend more time working on this site, I've started a blog about the web site and other stuff related to Daredevil. Let's see how it goes after a week! IGN has an exclusive first look at next week's Daredevil #102. As always, spoilers ahead... thanks to Gloria for the tip! GIT Corp., the company that had been producing the DVD collections of Marvel comics, has announced that their license will expire 1/1/2008, and thus, the planned Daredevil DVD-ROM will not ship! Top Cow has another crossover with Marvel in February, and this time, DD has a book. The Magdalena/Daredevil will be written and penciled by Phil Hester, with inks by Ande Parks. Thanks to JP for the tip. VisionComix (who kindly sponsor my site) have some new DD hardcovers on sale at 40% off, including DD: Father, Volumes 1,3-5. DD: Father is $14.99 and the others are $17.99. Please head on over and have a look at some discounted books for ManWithoutFear.com visitors. The Daredevil Omnibus Companion, now scheduled to ship next month, has now added over 120 pages of extras. Penciled pages by David Mazzucchelli! Frank Miller's DAREDEVIL series bible from 1980! The original plot to DAREDEVIL #219, the script to DAREDEVIL #233 and the original drafts of the landmark DAREDEVIL: MAN WITHOUT FEAR are all featured in this essential hardcover for any Daredevil fan! Yes, I just pasted that from the press release. The Chat Room is now available 24/7 for use for members of the message board. It is integrated to use your login and password for the board. It uses addonChat software, which is written in JAVA. Feedback is appreciated. With numerous awards and critical buzz for Daredevil, Marvel urges retailers to check their orders on upcoming issues of this acclaimed series. Matt Murdock's being pushed to his edge and if he's not careful, Daredevil #101 may be the issue where it all might just come down crashing around him! And in Daredevil Annual #1, Daredevil is reunited with a face from the past.Black Tarantula.and it's time to learn if a man can really change. Is there an Elektra omnibus coming out next year, containing Elektra Assassin #1-8, Elektra Lives Again, Bizarre Adventures #28 and What If? (I) 35? 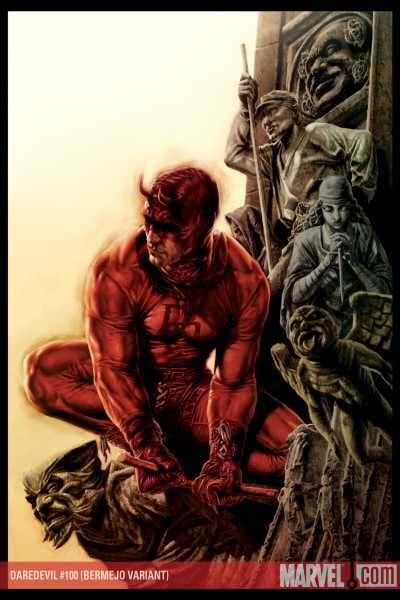 "Daredevil: Demonios y Oscuridad" is a comprehensive book about Daredevil (and Elektra) which serves as the definitive guide to the many years of Daredevil history. Taking in every aspect of the character's career throughout pop-culture -including but not limited to films, statues, TV series- the author reviews chronologically all the comics related to Daredevil, without forgetting special numbers, miniseries and various projects and he analyzes the four decades of the character in the meanwhile. This book showcases never-before-seen artwork, a complete insight of the Daredevil film, interviews with many key figures in Daredevil's world, including artists Frank Miller, John Romita, Joe Quesada, and much more! Congratulations to Ed Brubaker, and the entire Daredevil creative team for their Harvey Awards today for Best Continuing or Limited Series and Best Writer! 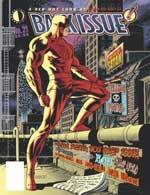 The first of two interviews with the Daredevil: Battlin' Jack team has been posted. Co-writer/artist Carmine Di Giandomenico talks about the series and what he wanted to showcase about Jack Murdock. Diamond Select Toys will have an exclusive Marvel Zombies Minimates Two-Pack, featuring zombie versions of Goliath and Daredevil! Congrats to Daredevil writer Ed Brubaker for taking home the Best Writer trophy and also the Best New Series win for Criminal! Wizard has some pics of the Marvel Legends figures coming out in December... including a Daredevil Yellow figure! It appears Daredevil 99 has been pushed back to August 8, from its July 25th ship date... just in case anyone is going out to look for it today. Marvel.com has posted a video interview with Joe Quesada at his gallery show for the Santerians. The exhibit has been extended to September 15. If you've never seen the variant covers for DD100, I've finally got some pics for you. The first is by Michael Turner, and the other is by Lee Bermejo. The regular wraparound cover can be viewed in the PREVIEWS section of the site. If you've checked out today's October solicits, you'll see info on the Daredevil Annual. What you'll also notice is that there isn't a Daredevil #102 coming out that month. It's probably a way to give the Lark/Gaudiano team a much needed break, but I'll try to get a response from Marvel about it. The annual is written by Ed Brubaker and Ande Parks, who makes his return to the pages of DD. It's drawn by Roy Allen Hernandez. Vote for the 2007 Wizard Fan Awards, which has several DD-related creators and characters nominated! Daredevil, Ed Brubaker, and even Foggy Nelson! If you are a member of the Bowen Designs' Collector Club, you have the opportunity to purchase a limited edition Armoured DD Mini-Bust for $55 (plus shipping). More details at the Bowen Designs site. Just a reminder, if you live in the NYC area, that "An Evening with Joe Quesada" is tonight at CCCADI. For more info, please check out the Santerians site. CBR has a new interview up with Battling Jack co-writer/artist Carmine Di Giandomenico. Lots of info on how the project came to be, and some preview art. The first issue ships this week! If you're interested in any of David Mack's work (Kabuki, Daredevil, etc. ), be sure to tune into tonight's Fanboy TV show. 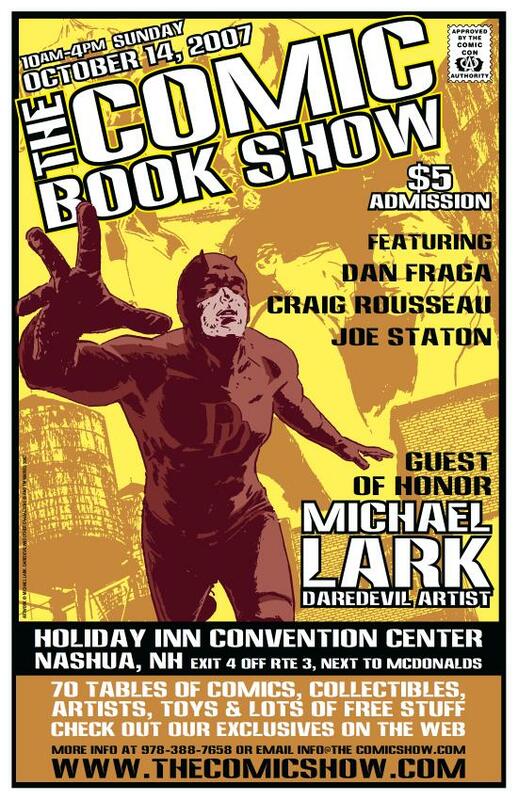 Greg Jurls, creator of the David Mack DVD, will be interviewed, as well as David Mack by webcam. The show is tonight at 7PM CST. Once again, congratulations to the Daredevil team, for their Eisner and now Harvey Award nominations! 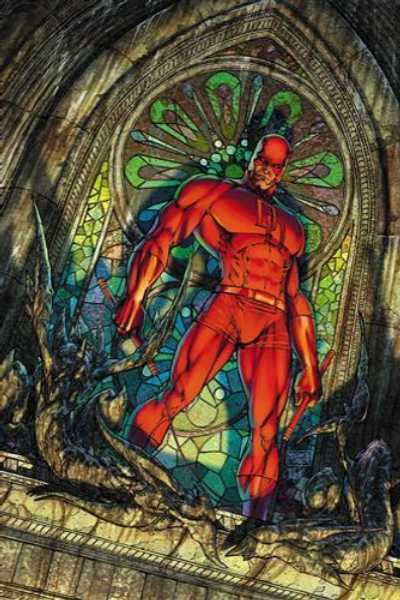 Thanks to Michael for the tip... looks like GitCorp will be releasing a Daredevil DVD-ROM in 2008, which will have all the Daredevil issues included. This week's DD#97 is available for preview at PCS... thanks to JP for the link. The Team Talk continues at Newsarama, this time with writer Ed Brubaker. There's also a link in the interview to the previous interview with editor Warren Simons. The Santerians show at the CCCADI continues, with a special Evening with Joe Quesada on Thursday June 7, 2007. If you are interested in attending, please click on the link below and RSVP if you'd like a copy of DD: Father. Michael Lark has an interesting post on his MySpace page... it's about how he prepares to lay out pages based on Ed Brubaker's script... SPOILERS AHEAD though, as a script page from DD#98 is presented. Want to see the cover to #100? Want to see pencil artwork? Have a peek at editor Warren Simons' interview on Newsarama... along with lots of other great info on who's doing artwork for #100! My apologies to anyone who was looking for last week's shipping info... I was away on vacation. CBR has another interview posted, this time with current DD writer Ed Brubaker, and there's artwork from this week's issue... and news about what's in store for DD#100! CBR has a new interview up with Brian Michael Bendis, where the former DD writer talks about the forthcoming Daredevil: End of Days series! Congratulations to the Daredevil team for their nominations for the 2007 Eisner Awards! In addition, Ed Brubaker was nominated for his Captain America and Criminal work. An evening with special guests from Marvel Entertainment, Inc that will discuss the origin of the "Marvel Comic Book." A technical discussion that will include the writing, illustration and coloring of this immensely popular American art form. Thanks to Giovanni who's informed me that the Bowen Design Gladiator Mini-Bust sneak peek is finally online... check it out! 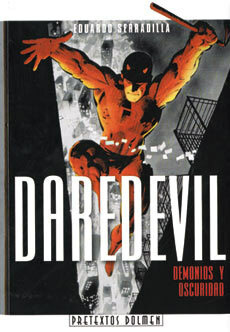 * There have been some criticisms about the new Daredevil omnibus, related to its glued bindings. If you've got a copy, let me know how it is and what are all the extras! * Please help support the site by visiting the sponsors or donating money through PayPal. Thank you! BLACK INK: A panel discussion that looks at the diversity of illustrated and animated images of people of African descent from the Caribbean, America, Latin America and worldwide. Axel Alonso - Editor, Marvel Entertainment, Inc.
Also on sale in the CCCADI gift shop Daredevil: Father the graphic novel. Daredevil cover artist Marko Djurdjevic has a sketchbook up on the Marvel.com site. Check it out to see the DD#95 and other covers and some preliminary sketches. There's a preview of DD#95 up at ComicBloc (without text) of DD#95, so head on over if you want anything spoiled... Thanks to Forrest for the link. The issue features a 28-page, art-rich article on Daredevil, covering the eras of Miller, Janson, Mazzucchelli, Nocenti, and Romita, Jr. There are new interviews with Klaus Janson, John Romita, Jr., Ann Nocenti, and Ralph Macchio, AND a 4-page DD art gallery featuring rare illos by John Romita, Sr. and Gene Colan. I've posted a new interview with Daredevil editor Warren Simons and he's provided some art of the new Battling Jack mini-series. Hope you guys enjoy the interview! Marvel Associate Editor of Collected Editions Mark Beazley kindly forwarded some pics to share on the site of the DD omnibus! Many thanks to Mr. Beazley! And more! There's over 60 pages of extras. Former MST3K writer Michael J. Nelson has posted a new DVD commentary for DAREDEVIL on his site... it's $2.99 to download, but you can listen to a sample of the playground scene. No one can last forever. At one time Matt Murdock lived his days as an attorney and his nights as the sightless scarlet sentry known as Daredevil, but all that is over now. For the first time ever, see the world through the eyes of a blind man as you read journal entries featuring his private thoughts, hopes, and fears starting with the event that changed everything: the death of Karen page. With each new issue starting from the events of The Devil in Cell Block D, you'll be treated to the inner thoughts of Murdock like never before. Back in January 1996, Daredevil was in the midst of the J.M. DeMatteis run on the book. The title was still in the "Marvel Edge" imprint. Cary Nord was just starting his fill-in art which would lead to his work with Karl Kesel later in the year. And I started this web site. The site has seen Karl Kesel hand off to Joe Kelly, the Flying Blind arc, the Marvel Knights launch, the delays, the movie, the Bendis/Maleev run, and now Brubaker/Lark. I've had the opportunity to interview several creators, and I have had the good fortune of being asked to write the Marvel Knights encyclopedia. But the site is nothing without its audience, and there are many of you that I've known for so many years who visit all the time. I appreciate all the support this site receives and do not take any of these 11 years for granted. Newsarama has a new feature with Brian Michael Bendis about the members of the Avengers post-Civil War... first up is Echo [Ronin]... and why is she dressed as a man? Next week's Thunderbolts #110 is previewed at Newsarama, with some Bullseye and DD (sorta)! * Best Story Arc - "Devil in Cell Block D"